Welcome back to Ho-Lee Noodle House, where you can get fantastic take-out. . .unless you get taken out first. Lana Lee works as a server at Ho-Lee Noodle House, the restaurant owned by her parents. 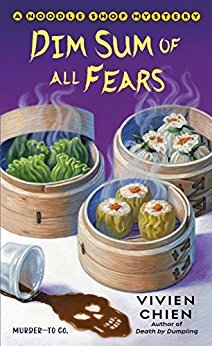 Lana longs to do something else with her life, but she is needed at the restaurant, especially now that her mom and dad must travel to Taiwan to deal with a family crisis. Things get even worse for Lana when a good friend becomes a victim of a tragic, fatal incident. Detective Adam Trudeau, Lana’s sometime boyfriend, warns her not to get involved, but Lana continues to investigate to get justice for her friend. This book is the follow-up to Chien’s “Death by Dumpling”. It’s not necessary to have read this book to enjoy this one, although there is a large number of characters to keep track of. An old-fashioned “Cast of Characters” at the beginning of the book would have been helpful. I like Lana and most of the other main characters, although Lana’s condescending sister and pushy mother are sometimes hard to take. I like the setting of the Chinese restaurant and the entire Asia Village shopping area in which it’s located. The mystery itself is interesting and Lana does a good job of questioning witnesses and potential suspects. There are plenty of surprises in the book’s clever plot and I enjoyed this fast read and look forward to seeing what’s in store for Lana in both her working and her love life in future books.